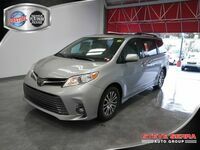 The new model year of the Toyota Sienna is carrying on the previously established traditions of style, function, and capability. 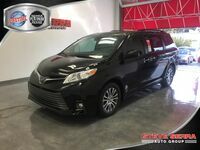 For its new model year, the 2018 Toyota Sienna has expanded standard feature offerings, brining drivers more value at every trim level. This forward-thinking minivan is redefining what it means to be a family vehicle. With standard Toyota Safety Sense™ P (TSS-P) and a variety of convenience features to love, the 2018 Toyota Sienna is a great choice for your next minivan. This minivan gives you access to a ton of valuable features like the standard high-resolution 7-in. touch-screen display and the available Bird's Eye View Camera. These technologies help you to navigate in and out of tight parking spaces with ease and increases peace of mind, even in busy parking lots. You'll also be privy to the power Split & Stow 3rd Row™ seat that lets you load gear, groceries, or whatever you need to take with you on the road. With available entertainment features, this minivan is ready for the open road. When you choose to lease, you open yourself up to a wide variety of benefits. Car shoppers that like to update their vehicles often do well with leasing. Generally, leasing is a shorter term than you would own a vehicle. This allows you to update your ride quicker than usual. Plus, if you don’t want to commit to a new vehicle, leasing can help you still have access to a new model, but without the standard commitment of purchasing. Also, you will generally pay less per month when you lease than if you would buy. This lets you keep more money in your pocket and allow you greater versatility. Be sure to check back often as we are always updating our leasing offers at Serra Toyota. 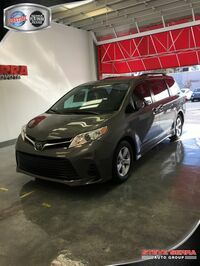 Interested in a New Toyota Sienna? The 2018 Toyota Sienna offers the full TSS-P suite of safety equipment to give you peace of mind while on the road. The 2018 Toyota Sienna is equipped with a 3.5L V6 DOHC 24-Valve engine with Dual VVT-I. The 2018 Toyota Sienna's performance features will give drivers access to 296 horsepower and 263 pound-feet of torque. 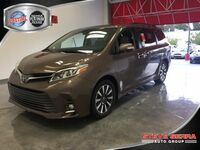 The 2018 Toyota Sienna is spacious and has room for up to eight passengers to sit comfortably. Standard features on this model include Projector-beam halogen headlights with auto on/off feature and Daytime Running Lights (DRL), integrated backup camera, and more! The 2018 Toyota Sienna has a total of seven trim levels from which drivers can choose their next minivan.